Now let’s get serious, folks, do we really need a drinking game designed around the Super Bowl? Heck no! Most people will be blitzed before kick-off. Here I present a drinking game for the Super Bowl Party most Americans will be attending. The Super Bowl Party allows for some keen observation of human behavior while socializing with people of all ages in various forms of food and alcohol induced inebriation. 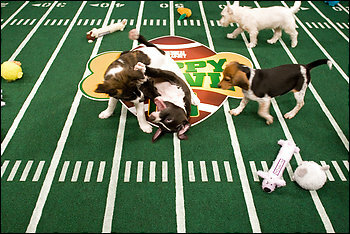 -A woman or small child requests that the person in control of the remote switch over to the Puppy Bowl on Animal Planet. -Somebody says they only watch the Super Bowl for the commercials. -Somebody laughs way too hard at a totally unfunny commercial. -The person with the remote switches over to the Puppy Bowl without being asked. -Somebody wonders out loud whatever happened to the Bud Bowl and/or the Budweiser frogs. -Two guys debate over who is the greatest quarterback of all time. -Somebody brings up the 1972 Miami Dolphins. -People debate the merits of both Manning brothers. -The resident disgruntled writer/literary-type/film buff begins awkwardly spouting off quotes from There Will Be Blood while clearly intoxicated. POST MORTEM: Who would’ve guessed the Giants would drink the Pats’ milkshake like that in the 4th quarter? Oh well, the ridiculous 7-3 score earlier allowed me to win the 2nd and 3rd quarters in our party’s block pool. Lesson learned: Never bet against a Manning brother. This entry was posted in Drinking Games, Pop Culture, Sports, Television and tagged Animal Planet, Football, I Drink Your Milkshake, Super Bowl Party, Super Bowl XLII, The New England Patriots, The New York Giants, The Puppy Bowl, There Will Be Blood. – someone is trying to tell me that a linebacker is actually in really good shape! I’m a native non-football-fan with absolutely no clue whatsoever! For some reason I still get involved (((WHY??))) and I had a pre-game argument about that issue with my husband. Maybe someone can enlighten me how a 350 pound wobble in spandex could possibly be in ‘good shape’. You should also recommend going to AC and betting on 27. But I’m glad you learned about the power of the Mannings. And it seemed to be a good day for little brothers all around. At least I have your beer. And it shall be dranken. Which is a word in my book.